My husband never used to crave sweets. Ever. He always just ate a small ice cream cone or a bite of my cake whenever it was around. He never ate cookies, or cupcakes, or...well anything sweet. But then I started baking. A lot. Suddenly he formed a sweet tooth. A big one. One sweet he requests frequently are cinnamon sticky rolls. I LOVED my Grandma's recipe. Instead of just covering the inside of the dough with the cinnamon and sugar and roll, she covered the roll inside and out with the gooey goodness. 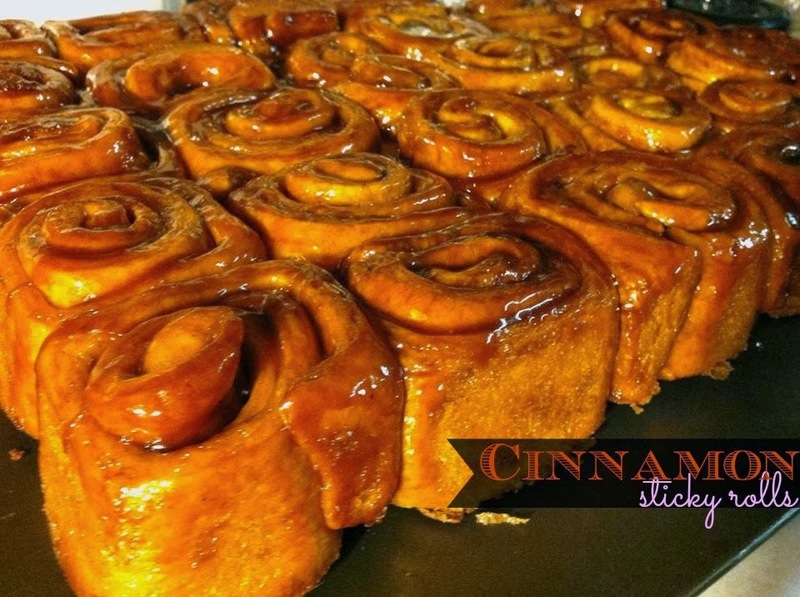 A cinnamon roll is a wee different, the kind with the cream cheese frosting or icing. 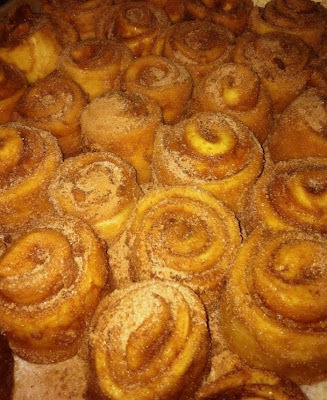 The trick to a great sticky roll is cinnamon. And sugar. And lots of them both. These are sticky and oh-so-good. I love to serve these on Christmas morning, or with a bowl of chili to bring back the classic school lunch! In a large bowl combine 3 cups of the flour and the yeast. Cook the milk, sugar and butter in a saucepan over medium heat until 120 degrees. Pour the warmed milk into the bowl with the flour and yeast mixture. Beat using the dough hook on a mixer, or by hand. Mix in as much of the remaining flour as you can. 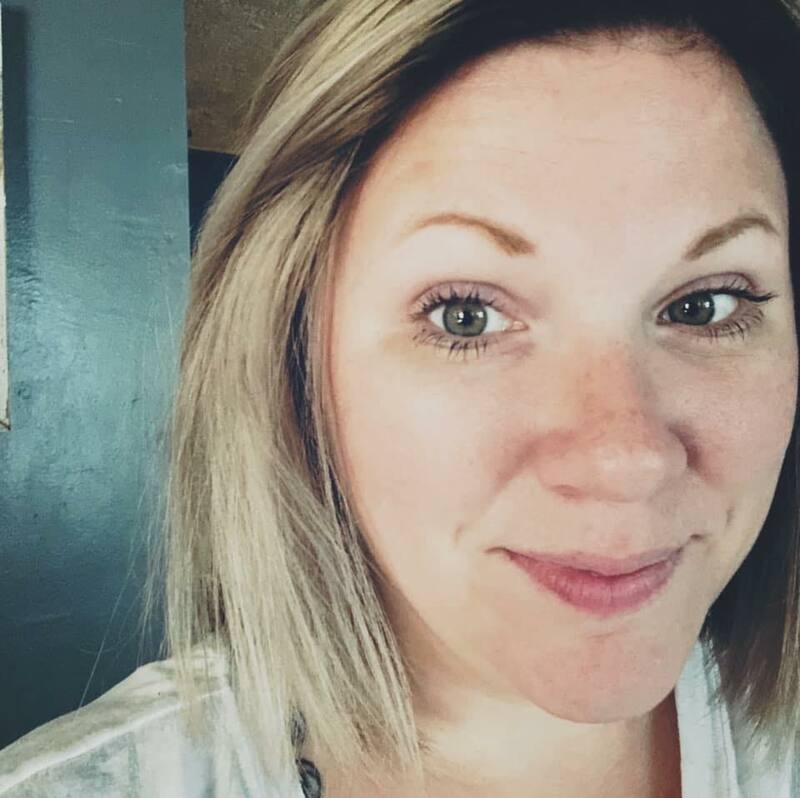 Form into a large bowl. Place into a greased bowl, turning to cover all the dough with the grease. Cover and let rise until doubled in a warm space, about 1 hour. Let dough rest while preparing the butter/sugar dips. Combine the 1 cup sugar and ground cinnamon together in another loaf pan. Roll each half of the dough out into a 12 inch square. Using a pizza cutter, slice into 8 strips. Butter the bottom of a 13x11 baking pan. Sprinkle the bottom with white sugar to cover it completely. Sprinkle ground cinnamon over the sugar. *If you want pecan rolls now sprinkle chopped pecans over the cinnamon and sugar. Dip each dough strip into the melted butter. Dip the strip into the cinnamon/sugar mixture. Roll the strip into a roll and place into the baking dish. Repeat with the other piece of dough until you have 16 rolls. You may need to melt more butter, or add more sugar/cinnamon mixture. Let the rolls rest for another 1-2 hours. Immediately after removing from the oven, invert the pan onto a large baking sheet or foil-covered counter top.